For other people named Guthrum, see Guthrum (disambiguation). 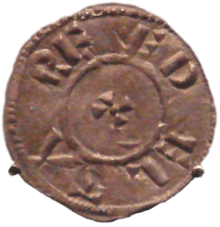 Guthrum or Guðrum (died c. 890), christened Æthelstan on his conversion to Christianity in 878, was King of the Danish Vikings in the Danelaw. He is mainly known for his conflict with Alfred the Great. It is not known how Guthrum consolidated his rule as king over the other Danish chieftains of the Danelaw (Danish ruled territory of England), but we know that by 874 he was able to wage a war against Wessex and its King, Alfred. In 875 the Danish forces, then under Guthrum and Halfdan Ragnarsson, divided, Halfdan's contingent returning north to Northumbria, while Guthrum's forces went to East Anglia, quartering themselves at Cambridge for the year. Under the Treaty of Wedmore the borders dividing the lands of Alfred and Guthrum were established, and perhaps more importantly, Guthrum converted to Christianity and took on the Christian name Æthelstan with Alfred as his godfather. Bernard Cornwell's first three novels of The Saxon Stories series The Last Kingdom, and The Pale Horseman, and Sword Song. On screen, he was played by Brian Blessed in King Alfred, episode 4 of Churchill's People, by Michael York in the 1969 film Alfred the Great and Thomas W. Gabrielsson in The Last Kingdom. ↑ Collingwood, M. A. and Powell, F. Y. Scandinavian Britain (New York: Society for Promoting Christian Knowledge, 1908), p. 94. 1 2 Anglo Saxon Chronicle Trans. by M. J. Swanton (New York, Routledge: 1996). ↑ Davis, R. H. C. From Alfred the Great to Stephen (London, The Hambledon Press: 1991) p. 48. ↑ Dumville, David; Lapidge, Michael (1985). The Annals of St Neots with Vita Prima Sancti Neoti, The Anglo-Saxon Chronicle: a Collaborative Edition. Cambridge. ISBN 978-0-85991-117-7.